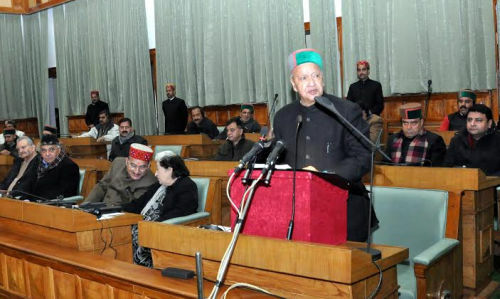 Shimla: Himachal Pradesh Chief Minster Virbhadra Singh presented Budget Estimates for the year 2014-15 in the Vidhan Sabha here today. Chief Minister, who also holds the finance portfolio, presented the budget proposal of Rs 4,400 Crore for the year 2014-15, compared to Rs 4,100 Crore in 2013-14. The total budget expenditure was estimated for 2014-15 is Rs 23,613 Crore, out of which estimated expenditure on salaries is Rs 7,647 Crore, on pensions Rs 3,496 Crore, estimated interest payments would be Rs 2,750 Crore, and loan repayments are expected to be Rs 1,511 Crore apart from Rs 367 Crore on other loans and Rs 1,840 Crore on maintenance. As per budget estimates for 2014-15, the total revenue receipts are estimated at Rs 16,522 Crore and the total revenue expenditure is estimated to be Rs 19,784 Crore with a revenue deficit of Rs 3,262 Crore. The expected receipts in capital account of the Government are Rs 3,860 Crore apart from Rs 1,125 Crore in Public Account including Provident Fund, etc. Capital expenditure including loan repayments is estimated to be Rs 3,830 Crore. The fiscal deficit for 2014-15 is likely to be Rs 5,354 Crore. Chief Minister proposed a budget outlay of ` 238 Crore for the Food, Civil Supplies & Consumer Affairs Department during 2014-15. Chief Minister allocated Rs. 384 Crore for Agriculture and Rs. 192 Crore for Horticulture Sector. In the Budget Estimates for the year 2014-15, an allocation of ` 279 Crore has been proposed for the Animal husbandry sector. 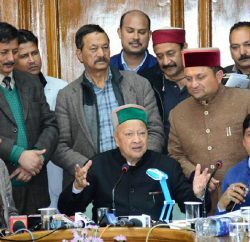 Himachal Pradesh government proposed a budget allocation of Rs 437 Crore for the Forest Department. In the budget outlay, Rs 355 crore was allocated for the Panchayati Raj Department. Rs. 490 Crore was allocated for the Revenue Department during 2014-15. 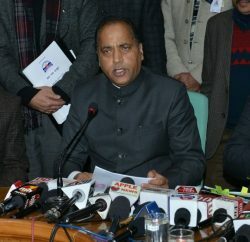 Chief Minister proposed a total budget outlay of ` 1,500 Crore for the Irrigation & Public Health Department during 2014-15 and Rs 240 Crore proposes to provide to IPH Department to meet the Energy Charges of Water Supply and Irrigation Schemes. Rs. 985 Crore was allocated for the MPP & Power Department during 2014-15. Govt has proposed to set up an ‘HP Investment Promotion Cell’ in the Department of Industries to drive new investment in the State. CM also announced to set up an ‘Industry Advisory Council’ under his chairmanship with representatives of industries to create a platform for deliberation of policy issues for industrial development in the State. Budget allocation of Rs 175 Crore was made in the shape of grant and equity in 2014-15. 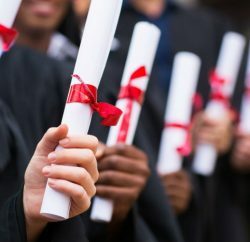 A budget outlay of Rs 2,384 Crore has been proposed for the Public Works Department during 2014-15. .
Government proposed to allocate Rs 4,282 Crore for Education for the year 2014-15. Budget of Rs100 Crore for the Skill development initiative was made in the State in 2014-15. Govt proposed a total budget outlay of Rs 262 Crore for the Women & Child Development Department during 2014-15. Govt proposes a total budget allocation of ` 924 Crore for Tribal Areas in 2014-15.